Quelab a finalist for the Mayor’s Prize for Entrepreneurship! Quelab is one of the finalists for the Mayor’s Prize for Entrepreneurship! We are pleased to be considered along with 10 other wonderful organizations in Albuquerque. Congratulations to all the finalists! We have already accomplished so much since Quelab’s founding in 2010, and it is an honor to be recognized for what we have done so far by reaching the finalist level for the Mayor’s Prize. It is wonderful to see people finding their inspiration to become “makers” of things, taking small steps like learning to solder, turning wood on a lathe, or 3D printing an object can inspire so much more! 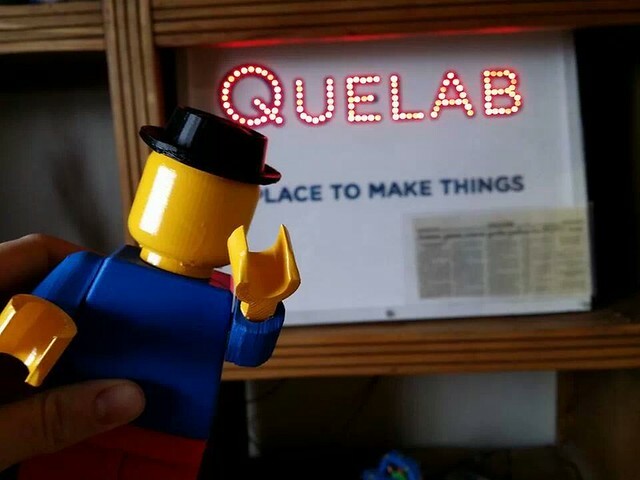 At Quelab you might see a child learning to code, a professional artist learning to use a laser cutter, or an entrepreneur connecting with other makers to figure out how to build a product. Quelab is more than just a place to make things, it’s also a community of makers. We hold formal classes and we also learn from each other via informal connections that bring new ideas to life. More than a dozen entrepreneurial businesses make use of the tools, equipment, and community at our Albuquerque makerspace for diverse needs from meeting and classroom space, to prototyping new products, and even manufacturing final goods. The strength of our community is why MAKE Magazine selected Quelab as one of their Most Interesting Makerspaces in America. First of all, I’d like to give a big “Thank You” to every member who attended or sent in a proxy ballot! The results of last night’s elections for the Quelab Board of Directors are in! New board members Jezzri Cochrane and Lissa Knudsen join returning board members Adric Menning and Geoff Nicholson. They join Addie Fryweaver, Cameron Goble, and Charel Morris in making up our board. Congratulations new board members, and thank you all board members for your work on the betterment and continuation of Quelab. If you have any questions or problems on anything they can help with please contact one or more of them. For anyone else who would like to be of service to Quelab, we always have room for more volunteers! If you ever buy things online, you can help support Quelab by using our Amazon or MakerShed affiliate links. By putting them in your bookmarks, and using that link, instead of typing them into the address bar, we get sent a smidge of money for each purchase. if you’re looking for inspiration, check out our (infrequently) curated Amazon shop. If you like buying electronic components and kits from folks like Adafruit Industries and Sparkfun Electronics, we do quarterly buys from them where we charge you list price off their website (no shipping), and we make a bit of money on the sales. The only concern with these is that we do have to have a minimum order of $300 per order to be able to get the deal. Check the members list, or our Facebook page for announcements of the buys being scheduled. 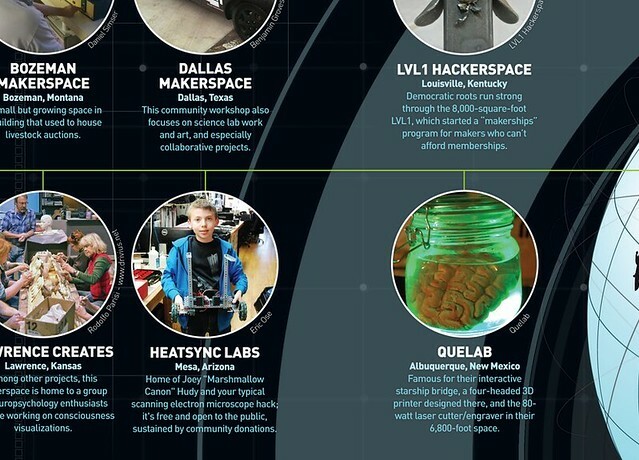 In the most recent edition (Vol 40) of Make: Magazine, Quelab was listed as one of the “Most Interesting Makerspaces in America”, listed in the southwest section with folks like HeatSync Labs in Scotsdale, Arizona; LVL1 in Louisville, Kentuckuy; and the Dallas Makerspace in Dallas, Texas. If you’re interested in purchasing a copy of the magazine which features Quelab, click on the magazine cover above to order it through our Amazon affilliate link . Or you can Subscribe to Make to keep getting intersting project ideas every few months. For selected back-issues of Make:, check out the Quelab Library! Congratulations to all the makers and hackers who make Quelab great, and whose projects make Quelab awesome! Keep making! People sometimes ask me ‘where does all the money go’. Ok, People don’t really ask me that, but I figured I ought to show folk where things do go. The answer is “Rent and Utilities”. I was inspired by the London Hackspace’s “Cost of Hacking” page, and figured I ought to throw one together for us as well. So, here is the Quelab Cost of Hacking. As you’ll note, we’re still short. We’ve still got a spot of reserve left from our Kickstarter, but we’re burning through it quickly. We have no employees, and none of the directors or officers make a dime off this project. A lot of the expenses after rent and utilities are costs of doing business; Credit Card fees, State and Local incorporation taxes, General and Directors Liability insurance, and the like all eat into our monthly income. So how do we carry on? Increased Membership and more Workshops. Fifty-three sustaining members and three workshops a month is our break-even point until November, when our rent goes up again. We are on target to have sixty-three sustaining members by then, but we need your help. Donations of both goods and services or money are gladly welcome. Quelab benefits if you shop at Amazon using our affiliate link, and if we do group orders of hardware from Sparkfun and Adafruit, Quelab gets the difference between the Retail and Wholesale prices. But how else can you help? Consider teaching a workshop on something you know. Quelab charges $15 per person for most classes, and the class fees come straight to Quelab. Conserving energy (raise the thermostats, turn off the lights, coolers, and computers) helps as well, but not as much as telling your friends to come on down! Join Quelab at our Grand Opening celebration, Saturday 3 May 2014 from 10am – 6pm. This all-ages, free event will showcase the creativity and potential of Albuquerque’s Makers and Hackers and show off to the public the Makerspace where it can all happen. In our six-thousand square-foot area, where you can discover what your neighbours and friends are making and building. Join us for some collaborative art projects, a live mural painting, tours and demos of the space, and live performances. This is a free event, and we will be selling tokens for the various hands-on workshops for $2 per a token (some workshops may take multiple tokens). You will be able to pre-register for both the event and workshops on eventbrite.com, but advance tickets are not required. There will also be food trucks on-hand for your refreshment needs, including the Toasted Bean and Boiler Monkey. Join us for our Keynote Address and Ribbon Cutting; Presented by the School Factory, our fiscal sponsor, James Carlson will speak about the dynamic power of hackerspaces and non-traditional education. Materials fees are extra for the workshops, so don’t forget to buy your workshop materials tokens for $2 each at the door, or through eventbrite. Quelab is Albuquerque’s hackerspace. Our mission is to foster and sustain an environment that promotes creativity, invention, and collaboration at the intersections of science, culture, art, and technology. We support people inventing, learning, tinkering, and conducting citizen science. Welcome to the new Quelab board of directors. Thank you all whom attended or sent in a proxy ballot. Your input is very important to the future of Quelab! One minor change to our bylaws was made under full board consensus, and that was to drop the Quorum requirement from 70% to 60% to better reflect our active vs mostly non-local/non-active membership ratio. I don’t think that folks could have picked wrong with the candidates on the ballot. Everyone involved was passionate and would have been a fine choice, but while many of the previous members were re-elected we did change out 3 seats. Walter Duran, Ray Finch, Addie Fryweaver, Cameron Goble, Adric Menning, Charel Morris, and Geoff Nicholson. These folks are all here for the betterment and continuation of Quelab, if you have questions or problems or anything they can help with please contact one or more of them! For everybody else there is a lot of room for help, and especially lots of room and need for Officers(the people who are effectively the managers and taskforces for areas and activities). This is the public notice of election for the Board of Directors for Quelab. The members list and announcement list have already been notified, but for folks who aren’t on either, here’s the notification. Members in Good Standing are called to attend a special meeting to conduct the election, it will be held at Quelab (680 Haines NW, Albuquerque NM 87102) on Saturday January 25th, 2014 at 7pm. This will be the election of all 7 seats on the Board of Directors. This is intended to be a quick vote and will not take up too much of your time. The slate of nominees and proxy ballot will be sent out to all members in good standing on January 18th. In order to reach a quorum at least 70% of the membership is needed to participate (in person or via proxy vote). This is a very important meeting, your attendance is highly encouraged. Our new location is 680 Haines NW. Hack nights will still be held at our South Campus until 24 November. Any assistance that the membership can render would be greatly appreciated. Whether that’s putting things into boxes on the 10th, driving the boxes from one building to the other on the 17th, or helping us unpack everything at the North Campus on the 24th, it is all needed. Additionally, some of the work that is being done to make the place habitable and friendly to hacking will be done by us Quelabbers. We are in need of labourers to help in removing walls and debris under the supervision of the landlord’s contractor. Updates will be posted to the blog when we have more information. After getting everything loaded up on the 10th, most of the people involved decided it was easier to move everything that day, rather than waiting until this week. So the majority of the boxes and large things have been moved over to the North Campus. However, the internet is not yet on at North Campus, and there aren’t any chairs in South Campus. The Telco should be moving the internet at North Campus on Wednesday 20 Nov….